Fur animals are farmed to provide raw material for clothes designers and the fashion industry. The ethics of fur farming is an important topic and should always be considered, but it will not be covered here. This post is about the practices of fur farming, fur animal species and caring for fur animals. Every year nearly 60 000 000 mink pelts and 4 000 000 fox pelts are produced, with Denmark as the leading producer of mink pelts (over 15 million annually) and Finland of fox pelts (nearly 2 million). When these numbers are considered, it is obvious that fur farming is important to the national economy to some countries. Still, major fur producing countries like the Netherlands have banned fur farming due to ethical concerns. 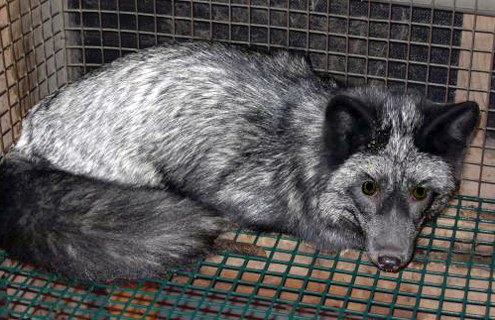 Finland's house of parliament voted on the subject in 2012, and vetoed a bill demanding to end fur farming. Minks are the smallest of fur animals, weighing 1-4 kgs and ranging from black to brown to white in color. Minks, like all fur animal species, come to heat once in a year in the spring. Female minks are in heat during the beginning of March. Mating induced ovulation, so the mating time does not need to be carefully planned, and usually each female is mated 2-3 times. One male is allowed to mate with 4-5 females. The gestation period for minks is 40-70 days. Most minks in one farm have their litter within 2 weeks from each other. Naturally minks would deliver 6-7 pups, but in captivity only 4-5 pups survive to adulthood. Minks are killed with gas (CO / CO2) and skinned in November, apart from breeding animals which are kept over the winter and mated again in Spring. Minks are raised either alone, or two or four animals in one cage. Studies show that group housing reduces stereotypical behavior, but only if the groups are kept steady and balanced. Usually groups consist of pups from the same litter, with one female and one male, or two of both. In Europe, four pups or 2 adult animals may be kept in a cage of 2550cm2 in size. In the wild each mink would live alone in a territory covering several hectares. The blue fox originates from the endangered arctic fox. Its weight ranges from 8-12 kg, but the largest males can be near 19 kgs. The largest animals are not muscular but obese: foxes are overfed to make them fat, which increases the size, and thus the price, of the pelt. Obese animals suffer from major health issues, such as bent legs and difficulty to move. In recent studies in Finland, blue foxes with healthy legs are a rarity. Because fat animals breed poorly, the animals kept for breeding are kept on minimum food during the winter, so they lose weight and are able to breed in the Spring. While it mimics the natural habit of the animals (gathering body fat in the fall for the harsh winter), in farms it is taken into extremes and thus causes major stress for the animals. Blue fox females, vixens, are in heat for 4-5 days during February and March. Most vixens are artificially inseminated using sperm collected from male foxes in the same farm. The gestation lasts 51-53 days, and each litter has 5-7 pups. This is a very poor result compared to the litter size of wild arctic foxes, which is 8-10 pups. Blue foxes have a very thick fur to keep them warm. Because on solid surface the fur would flatten, the animals actually prefer net flooring to solid flooring. Still, overgrown claws and wounded paws may occur even if the net is covered with plastic. Silver foxes are descendants of the common red fox. They are smaller and leaner compared to the blue fox, and their fur is less thick. Silver foxes are not fattened and then starved like blue foxes, because due to their heritage they are more finicky eaters. Silver foxes are in heat for 2-3 days during January-April, and deliver litters of 3 pups after 51-53 days of gestation. In the wild the litters have 4-5 pups. Artificial insemination is rarely used, and one male mates with 4-5 females. Breeding blue and silver females are kept in the farms for approximately 5 years, after which they too are killed and skinned. In Europe silver foxes are raised in cages of two, or a female with her pups.The cages have a nest during whelping, and a shelf to provide a "solitary" place where the animal can watch its surroundings. Foxes want to see what happens around them, which is why they are often raised in a "shadow house" with free visibility to every direction. Raccoon dogs weigh from 5-15 kgs, and come to heat for 3-4 weeks during February-April. Like with silver foxes, each raccoon dog male mates with 4-5 females. The gestation period is 60 days, after which a litter of approximately 6 pups is born. In the wild litters have 6-12 pups. Raccoon dogs are monogamic: in the wild they form life-long partnerships, and both parents tend to the pups together. In fur farms this kind of behavior is entirely denied, and each female has to tend to her pups alone. On the other hand the farmed female doesn't need to hunt her food, and therefore doesn't have to leave the pups to go foraging. It is not known whether raccoon dogs should be farmed in pairs to improve their welfare. Ferrets are possibly the least farmed species, even though they can have up to two litters of 6 pups in one summer. In the wild each litter would have 2-17 pups, so the ferret is the only farmed animal whose litter size in captivity is not markedly smalled than in the wild. Ferrets come to heat in April and gestate for 42 days. The second heat occurs two weeks after the first pups are weaned. While these are the same animals than the ferrets kept as pets, farmed animals receive none of the caring of pets. They are raised in small cages, bred, weaned, killed and skinned like all other fur animals. The instructions and laws regarding pet ferrets do not apply for their farmed counterparts. Each year in a fur farm can be divided into six phases, regardless of the farmed animal species. Each year follows the same pattern: mating in early Spring, whelping during Spring and early Summer, and raising of the whelps and separating them into their own cages during Fall. 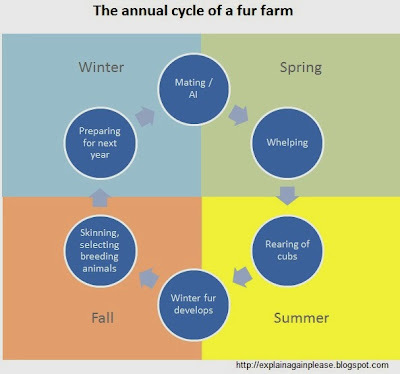 Selecting breeding animals and killing and skinning the rest takes place in early Winter, after which the breeding animals are "kept alive" until they can again be mated in Spring. You disgusting fucks. Please do us a favor and kill yourselves, especially since nobody even wears real fur anymore.